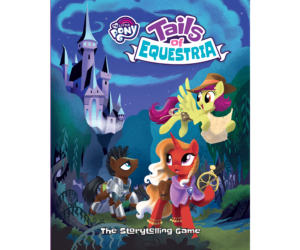 Two New Digital Tails of Equestria Books Available Now! Following on from the digital release of the Tails of Equestria core rulebook, you can now purchase the first two adventure books as downloadable PDFs on DriveThruRPG, or our own webstore. 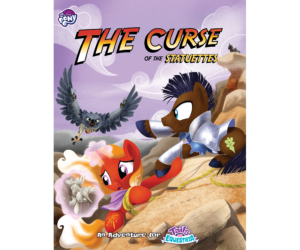 The Curse of the Statuettes is an adventure for Tails of Equestira – The Storytelling Game, and is perfect for Level 1-3 pony characters. In the adventure players will find that all over Equestria ponies have started to turn into figurine versions of themselves. Nopony knows why, nopony knows when and to make it all worse, nopony knows where the Mane Six have gone! It looks like it’s up to he players to travel to distant lands, overcome terrifying danger and save Equestria, neigh the world! 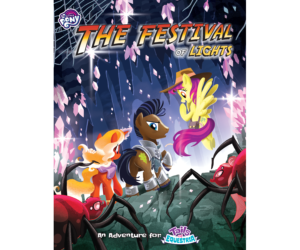 The Festival of Lights is perfect for pony characters levels 2-5. Players will encounter new creatures, new friends and lots of classic dungeon delving adventures all in the perilous depths beneath Equestria. Umberfoal is sheltered from the world, but plagued by threats from deeper in the darkness – and it needs help! Can the players delve into deepest lakes and darkest cave to face the dangers within? Will they be able to help Umberfoal hold their ancient and magical ritual, the Festival of Lights? To stay up to date with our latest news make sure you like the Official Tails of Equestria page on Facebook. You can also learn more about our other products by liking and following River Horse on Facebook, Twitter, YouTube and Instagram.